If you pre-schdule a Facebook Live event, they require that you connect with your feed 20 minutes before showtime. Verify your live video feed at least 20 minutes before the scheduled start time. To verify it, preview the feed by opening the scheduled video in your Video Library. The issue is since I am using the cloud when I hit the start broadcast button in Wirecast to test that the feed is connected it still won't go Live in Facebook until the scheduled time. However in YouTube and Periscope which is set to start automatically those are actually live for the 20 minutes before the actual Live event I want people to see. So now although Facebook is fine the YouTube video and the Periscope video has this long 20 leader that is recorded in the video that when someone goes to watch the replay in Periscope or YouTube they are seeing 20 minutes of nothing before they get to the content. I thought I could set YouTube not to start automatically, but when I do that I get an error message in Wirecast that the feed has failed and then it fails everywhere and I have to recreate my output settings. 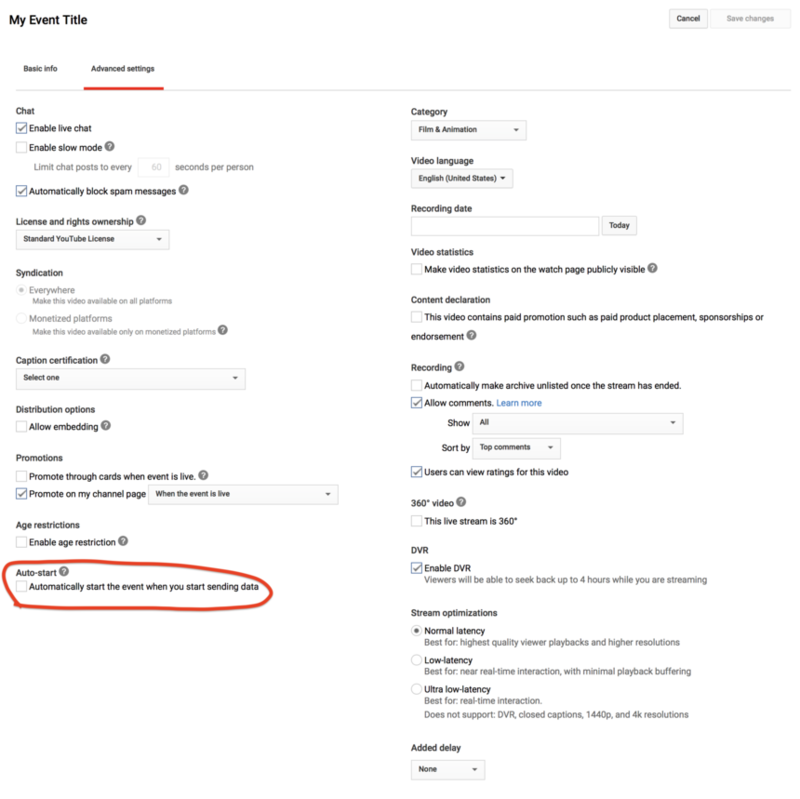 Facebook and YouTube both allow for scheduled events although you'll need to use RTMP Server for that as Facebook doesn't allow multiple destinations when using other APIs (Wirecast's built in setups for that destination). I don't think Periscope has a scheduling feature. You could use a countdown clock (Wirecast has a clock feature). Am using the countdown timer in Wirecast already. Alan Weinstein RTMP for Facebook and API for YouTube? 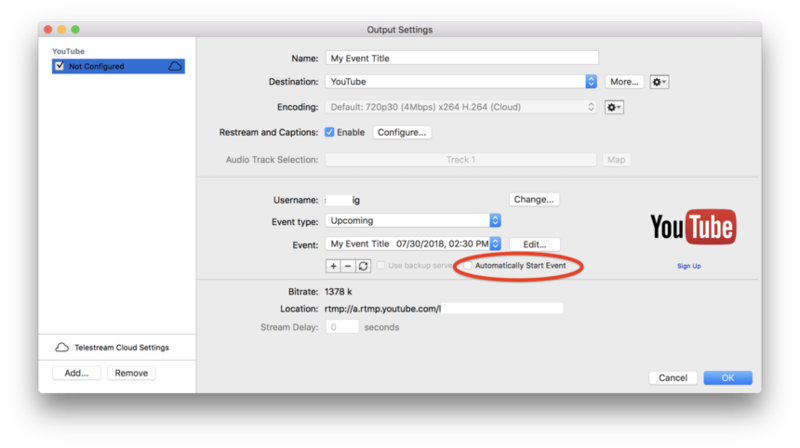 You can set Automatically Start Event and it should be respected. Alan Weinstein If using RTMP to YouTube and setting up in YouTube. CraigS In WirecastI don't tick auto start Event as I thought that would automatically start it when then the RTMP feed starts in FAcebook. CraigS so I figured out how to start each individually. by not ticking the autostart for either YouTube or Periscope and then starting TYo.uTube Manually in the Live Control Room. Periscope I started form the Output settings dropdown right in Wirecast. So all good. Alan Weinstein Good to hear you've figured out a viable workflow.